The California Sunbounce System was specifically developed to help the mobile photographer or filmmaker achieve fantastic lighting without the bulk and effort associated with traditional systems. Sunbounce is portable, lightweight and very easy to carry - even onto airplanes - to allow you to achieve desirable reflection, diffusion and shade no matter the limitations of the shoot. California Sunbounce reflectors are made with lightweight yet durable frames and hand-sewn screens for exceptional quality. California Sunbounce reflectors are versatile, lightweight and portable, so they are perfect for on-the-go filmmakers requiring lightweight systems. Each one has a flexible modular system that makes it possible to combine any California Sunbounce fabric to customize as a reflector, diffuser, flag or shade. 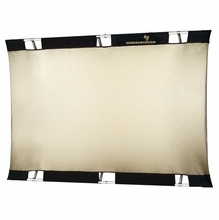 At BarnDoor Lighting, we offer Sunbounce reflectors in various sizes and colors to meet your needs. You can always contact us by phone at 1-888-276-3667 or by e-mail at info@barndoorlighting.com with your Sunbounce questions.